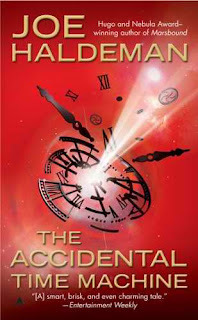 The Accidental Time Machine is Joe Haldeman 's most recent stand-alone novel written in a quirky style rivaling Terry Pratchett 's fun novels and even Douglas Adams ' Hitchhiker's Guide to the Galaxy series. Matt is a research assistant at MIT when the calibrator he's working on becomes a time machine by complete accident - hence the book's title. Upon discovering he's lost his job and his girlfriend to the man replacing him at work, Matt decides to take a trip with his time machine. We soon discover that the time machine can only move forward in time - not backward. The Accidental Time Machine is fun and engaging right off the bat! Matt's character is extremely likable; he's spunky, sarcastic and easy to root for in all his glory as the underdog. Haldeman toys with some fun theories and alternate universes. He writes a tremendously funny futuristic scenario in which the second coming of Jesus occurs in the latter part of the 21st century or so. It is reported that the President of the United States has Jesus appear to him in the Oval Office, and therefore bibles and history are rewritten. Ha! Time-travel and science-fiction enthusiasts will enjoy The Accidental Time Machine and seasoned readers will breeze right through it in just a few hours. Joe Haldeman is widely known for The Forever War (1974). Haldeman has most recently released Marsbound (2008) and Starbound (2010).